Wood doors provide a sense of warmth and welcome to visitors, while giving you the feeling of security your family wants and needs. 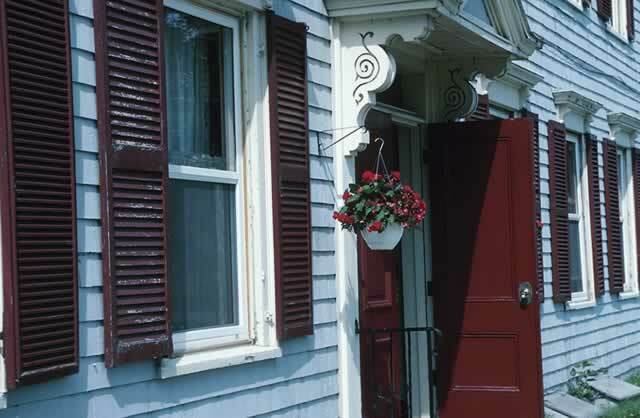 Long the traditional choice for exterior front doors, wood doors can be easily customized using paint or stain. Wood can also be crafted in nearly unlimited styles, sizes, and shapes. If you're looking for a door with intricate detailing, wood doors are capable of thousands of molding, paneling, and carving choices. Warping is a thing of the past. Today's door manufacturers typically use glued-up engineered-wood cores to ensure that the wood doors function with excellence in any weather and any part of the country. With a bit of maintenance, largely painting or staining every year or two, your wood door could even outlive the rest of your home.